I thought it would be interesting to create a spreadsheet for the NASDAQ 100. You'll notice in Sheet 1 that there are 2 sets. There is no reason for the two different sets other than Excel would not allow more than 70 stocks to be refreshed at once, so I divided it into two equal groups. To get daily or even by the minute (delayed 20 minutes) stock data click "data" and then "refresh all". Sheet 2 of this spreadsheet has each company and in order by Market capitalization. To refresh this click "data" "refresh". The way I use this as a tool is to see which stocks are being bought and sold. I rank them on a weekly basis by market cap to see which stocks moved up or down on the list on the NASDAQ 100. You'll notice the top 25 are quite hard to move, but the bottom 75% of the list vary on a weekly basis and could provide some insight on the stronger companies as their stock prices (overall market cap). It's Friday June 19, 2009 and it happens to be Quadruple Witching. I assume today will be very volatile and that volatility will explode in the final hour or so of trading. That said, I thought it would be interesting to lay out a few option buy/write ideas that- if they hold at or above current levels (in the money) - will yield at least 1% in one day. I understand that 1% isn't that much compared to some stocks that spike 25% in one day, but if this strategy was used at every options expiration and the underlying stock closes above the indicated strike, the method would add some additional cash to your portfolio. All call options listed are currently in the money and if they happen to expire less than the strike price, the premium received will provide at least 1.2% downside protection. These are extremely volatile stocks or ETFs (2X and 3X leveraged ETFs - see why I think they're DANGEROUS here). All data as of pre-market Friday June 19, 2009. The ideas outlined in this article are all the buy/write option strategy. If you plan on opening any of these positions, note that if the stock/ETF closes at or below the indicated strike price you'll end up with the stock - so be sure you're okay with that before you think of opening the position. If you have the stock already and are thinking of selling it, you're one up and can use this strategy to yield some additional gains. Of course, commissions play a major role as opening few of these contracts most likely won't generate too much. For more on the buy/write option strategy check out my option E-Books. Buy Write Option Idea #1: Buy Palm (PALM) stock and sell the June 13 Call option. This will give you downside protection of 3.3% on the stock, and a return of 2.8% assuming Palm closes above $13. The current options market is factoring in a 53.9% chance this will be above the indicated strike at close. Buy Write Option Idea #2: Buy Direxion Daily Financial Bull 3X (FAS) stock and sell the June 9 Call option. This will give you downside protection of 3.3% on the stock, and a return of 1.6% assuming FAS closes above $9. The current options market is factoring in a 59.4% chance this will be above the indicated strike at close. Buy Write Option Idea #3: Buy Direxion Daily Small Cap Bull 3X (TNA) stock and sell the June 28 Call option. This will give you downside protection of 2.7% on the stock, and a return of 2.0% assuming TNA closes above $28. The current options market is factoring in a 55.5% chance this will be above the indicated strike at close. Buy Write Option Idea #4: Buy Direxion Daily Large Cap Bull 3X (BGU) stock and sell the June 33 Call option. This will give you downside protection of 3.6% on the stock, and a return of 1.4% assuming BGU closes above $33. The current options market is factoring in a 66.7% chance this will be above the indicated strike at close. Buy Write Option Idea #5: Buy Direxion Daily Large Cap Bear 3X (BGZ) stock and sell the June 36 Call option. This will give you downside protection of 1.8% on the stock, and a return of 1.4% assuming BGZ closes above $36. The current options market is factoring in a 52.2% chance this will be above the indicated strike at close. Buy Write Option Idea #6: Buy ProShares UltraShort S&P500 2X (SDS) stock and sell the June 56 Call option. This will give you downside protection of 1.2% on the stock, and a return of 1% assuming SDS closes above $56. The current options market is factoring in a 48.8% chance this will be above the indicated strike at close. Buy Write Option Idea #7: Buy ProShares Ultra S&P500 (SSO) stock and sell the June 26 Call option. This will give you downside protection of 1.5% on the stock, and a return of 1.3% assuming SSO closes above $26. The current options market is factoring in a 52.9% chance this will be above the indicated strike at close. Buy Write Option Idea #8: Buy ProShares Ultra Oil & Gas 2X (DIG) stock and sell the June 28 Call option. This will give you downside protection of 2.6% on the stock, and a return of 1.5% assuming DIG closes above $28. The current options market is factoring in a 63.4% chance this will be above the indicated strike at close. Buy Write Option Idea #9: Buy ProShares UltraShort Financials 2X (SKF) stock and sell the June 43 Call option. This will give you downside protection of 2.2% on the stock, and a return of 1.8% assuming SKF closes above $43. The current options market is factoring in a 54.2% chance this will be above the indicated strike at close. Buy Write Option Idea #10: Buy ProShares Ultra Basic Materials 2X (UYM) stock and sell the June 18 Call option. This will give you downside protection of 1.8% on the stock, and a return of 1.2% assuming UYM closes above $18. The current options market is factoring in a 54.1% chance this will be above the indicated strike at close. Indicated strike may need to be adjusted throughout the trading day to reflect better % gains. 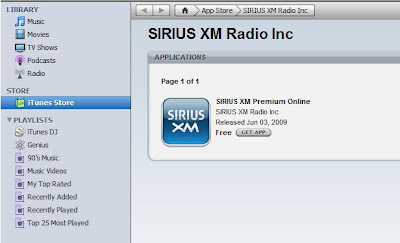 The long awaited Sirius XM (SIRI) app has finally launched in iTunes (AAPL), as the picture below shows (click to enlarge). This app has been long awaited and could mean positive things for Sirius. I do not know when the app first launched, but Sirius stock took off at about 12:30 PM Wednesday June 17, 2009 and continued to rally after the market closed. I guess the big deal is that this is just the beginning for Sirius with these portable devices, such as the Apple (AAPL) iPhone. If it has success, I am sure we'll see similar apps for other phones like those of Palm (PALM), Blackberry (RIMM), and even the myTouch by HTC, which uses Google's (GOOG) Android Operating system. This is much cheaper for Sirius (as they don't need the actual radio like in vehicles), and if it is successful will add to their bottom line. Some quick facts I can state about the app are: it does not include the Howard Stern channel (which people seem to be upset about), it's free with Premium SIRIUS or Premium XM Radio Online subscription (AKA costs $2.99/month to upgrade car radio to internet, or $12.95/month for internet radio without car radio), and they are giving a 7 day free trial (which is a great idea, in my opinion). I never believed this would mean anything for Sirius, but the hype is real. I was just reading some tweets on Twitter and people are excited to download this application. It looks like this could be a very bullish sign for Sirius, which is why I will outline this option strategy I have been using to get my shares cheaper with a large upside. (Learn more about this strategy check out my option E-Books). Here is an updated list of 15 stocks I'll be watching over the next week (as of pre-market June 18, 2009). Although the coverage of the Swine Flu has dwindled somewhat, as the Google news article timeline shows below, it's still a serious issue and could spark increased interest among the Pharma stocks (note data is published after month end which explains why June does not have any news reported on this timeline). There is also increased coverage of the healthcare sector due to the Obama administration’s plan (I don't know what to think of this yet). Therefore I decided I would devote this weekly breakout report only on stocks from the Healthcare sector. These are the current highest bull/bear rated stocks my technical screener has returned for the healthcare field (Bull:Bear ratio after each stock ticker). I have also indicated after each stock the Investor’s Business Daily (IBD) rating for each (Rating from 1 to 99, 99 being the highest composite rating; indicated after Bull:Bear ratio). To get a detailed definition of the bull/bear components check my Bull/Bear Ratio Defined Blog post by clicking here. To get a detailed list of criteria IBD uses to rate these stocks click here. I do not hold any of these stocks yet, but I am most interested in DexCom, MTS Medication Technologies, and Spectrum Pharmaceuticals. I will be looking to get into them on weakness. If they offer options, I may choose to speculate by purchasing Calls, or using the buy/write option strategy (for more info on these strategies check out my E-Books). Below are some stocks I own, blog about frequently, and include in every Breakout Stock Report (no specific order). First and foremost I must say I have the new Palm Pre and really like it. I write this post on the eve of Research in Motion's earnings release. A couple of these strategies have recently been posted on here, but I have refreshed the data to reflect pre-market June 17, 2009, and added a few more. In this post I will outline 5 option strategies (for more risky investors) I am likely to open. I will list these strategies in order from most likely to open to least likely to open. For more information about the option strategies used check out my E-Book. Option Strategy #1: Since we are approaching Research in Motion's (RIMM) earnings release, there is likely to be some increased volatility on RIMM's stock this Friday. I am opening a Straddle option position on RIMM for the June 80 strike. RIMM is expected to report after the bell on Thursday (June 18) and historically RIMM is either POP or DROP. By looking at the last 4 earnings releases for RIMM it looks as if it moved more than 10% (up or down) each time; July 25 earnings resulted in a 13.3% drop the next day, September 25 earnings resulted in a 27.5% drop the following day, December 18 earnings resulted in a 11.4% gain the next day, and April 2 earnings resulted in a 20.8 gain the next day. The straddle can be opened for about 10% of the cost of 100 shares or $800 for both contracts. This could pay off if RIMM moves over 10%. Let's say RIMM has a very good day or very poor day on June 17, I'd consider buying the straddle for the 75 or 85 strike depending on where RIMM was. However I am hoping RIMM closes as close to 80 as possible as I'll open my position around 3 PM. Option Strategy #2: With the release of the new iPhone 3GS, and the pre-order for the phone already being sold out, I will be opening a Buy/Write option strategy on Apple (AAPL) for July. If Apple happens to have a slight pull-back I will be looking to pick up some more shares and write it out for the July options expiration. I have been very bullish on Apple recently, and have been able to use the buy/write option strategy to make additional money (as I have been writing out of the money calls on Apple). Monday I will be analyzing which strike to write my Apple out for July (I will not have to buy it again unless Apple gets to 150 by Friday). I will most likely wait until we have about 15-20 days until expiration, unless Apple experiences a large gain before then. If I had to write my shares out today, the Apple July 145 strike looks like the best choice. It would give me downside protection of 2.1%, and a possible gain (assuming I purchased the stock June 17, 2009) of 8.4% in 1 month. Option Strategy #3: Although the phone by T-Mobile which uses Google's (GOOG) Android OS does not get too much hype, there has been a buzz lately about the second phone "myTouch 3G" which is made by HTC (HTC). Not likely, but imagine if this phone could get the same hype the Palm Pre did. That could be very good for Google. I will be opening a Long Call position for the LEAP 2011 expiration 450 range strike on Google; I have 584 days to write out higher strike for Google on any rally (making this position a spread). I will likely turn it into a spread if Google has a significant rally. I am thinking for the 550 to 600 strike range depending on the premiums I could receive. If the phone turns out to be a complete failure, it certainly won't be the end of Google, and this call position could still easily pay off. However if you have the capital to purchase shares on GOOG in lots of 100, I'd recommend that over this strategy. Option Strategy #4: With the release of the Pre and record sales for Palm (PALM), rumors of Dell (DELL) buying Palm, and many other rumors, Palm could keep riding the wave. Palm has yet to release the phone to a network other than Sprint (S), but if the phone comes to other carriers such as Verizon (VZ) I think it could be huge for Palm and carry the stock to the 20's just on that news. I have heard several rumors about the Pre coming to Verizon within 6 months, but as of now I can't seem to find anything that is confirmed. As stated above and in my blog I have the Pre and am very impressed. The only negative in my opinion is they only have 30 apps in the Palm App Catalog. More are sure to come, and that should tell us a lot of Palm's future success in the Smartphone space. Like Google I will be opening a Long position on Palm with a Bull Call Option Spread for the January 2010 15/25. This can be opened for about $180 per contract, and if Palm continues to rise the spread could easily pay off a whopping 555%. Yes 100% can be lost assuming the Palm January 15 expires dead, but this is a risk I am willing to take. I am hoping to get in this position within a month, and will likely try to open it if and when Palm experiences a pull-back. Some things to note are (1) Palm short interest is still extremely high 34.25%, and when Palm was at $2 a share or less I never remember it being more than 55% short interest float, what could another 15%-20% cover do for the stock? (2) The current options market is factoring in a greater than 25% chance Palm stock expires at or higher than $25 a share at January 2010 expiration, and a 50% chance Palm will expire at or above $17.50 a share come January 2010 expiration (will make profit on the position). Option Strategy #5: With the success of the E71, Nokia (NOK) has released an updated version of the E72. However after reading several articles about this phone, I am not impressed, and frankly not that bullish on Nokia. I am not an expert on Nokia phones, but I do know the new Apple iPhone, the Palm Pre, and Blackberry Tour will be an even tougher space to invade given their prices. I will be looking at opening a Put position for the October 2009 12 strike on Nokia if the stock rallies at all on increased speculation of the new phone. The E72 is not scheduled to ship until Q3, so I may move my strike to September when the expiration comes available. My ideal preference for this position would be 50-60 days until expiration and no more than $40 per contract to open. Those are my 5 in depth option strategies and the order I'll likely open them. If you like any of these ideas, but are more bullish/bearish you’ll want to adjust the strike price and expiration accordingly. It is important to have a good understanding of options before entering any position, to learn more about options check out my E-Books. APWR reported earnings this morning and missed by 8 cents a share. I was long this but after the report, I am debating selling. I thought they'd have another blowout quarter, but the stock market makes fools of all of us sometimes. I purchased back my covered calls for $5 a contract, of which I wrote less than 2 weeks ago for $250 a contract. I have a stop loss in and am hoping for an oversold bounce in the coming week, as I'd like to write it back out in the money for the July expiration. As of now I have purchased more shares of Palm for$15.18 a share and immediately sold the June 15 Calls on them for $85 a contract. That's right I have a downside protection of 5.6% and an upside possible gain of 4.4% in 4 days! The current options market is factoring in a 57.5% chance these will expire in the money. I am still bullish on Palm so I may be buying more and writing them for the July 17 or 18 strike, that's after Id fetch $20 a contract to write them out for the June 17. Crude is most likely rallying as we enter peak driving season, but I believe the price of crude is mainly reflecting the dollar. If the dollar gets stronger crude will fall, and if the dollar gets weaker crude will rise. As the dollar strengthened on June 15, 2009 crude sold off. This is also during a chaotic time in Iran, and as we know from the past, usually whenever there is tension in the Middle East the price of crude oil rises. Buy Write Option Strategy #1: Buy First Solar (FSLR) Sell the July 185 Call option. This will give you an immediate downside protection of 6.4%, with a possible return of 9.8%.The options market is factoring in a delta of .53 (53% risk neutral probability of expiring in the money). Out of these 10 strategies, the strategies which appeal most to me (keep in mind I'm a higher risk investor) are the UCO ETF option strategy and the A-Power Energy July option strategy. This is because the returns for these both are higher than the average of the 10 listed in this strategy, and the current risk neutral probability of expiring above the indicated strike is average. As recently posted on my blog, I believe financials are due for a consolidation period. The financials have demonstrated a tremendous upside move over the past 3 months (the least volatile of this list, the Financial Select Sector SPDR (XLF) is higher by 69.24% since March 12, 2009 - first Google chart). However as we can see from the second chart of the XLF below, it looks as if the financials have moved sideways in the past month (XLF higher by 23 cents or 1.88%) (Click charts to enlarge). Today I will be writing about 15 Financial stocks/ETF’s that I have been using to create some cash flow over the past 3 months. The strategy used in this article is the buy/write option strategy. All of the ideas outlined in this article have been researched and set so they will give me at least 10% downside protection and return at least 3% by July expiration (excluding strategy #13, and assuming the option expires in the money), and all have Delta greater than .60 (risk neutral probability of expiring in the money according to current options market). To learn more about opening, closing, trading, and calculating these strategies check out my option E-Books. I believe financials will continue to consolidate until fall of the year. Major reasons include: I expect the overall market to move sideways in the months ahead and the fact that historically stocks do not experience great gains during the summer months. 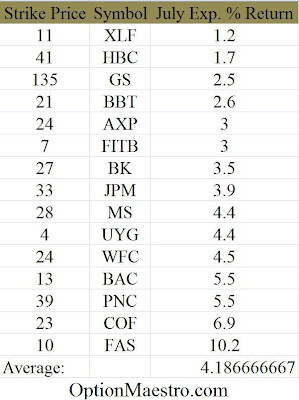 I have outlined the buy/write ideas below (stocks are ranked alphabetically by ticker, ETF’s ranked by volatility). All data as of pre-market June 15, 2009. Option Strategy #1: Buy American Express (AXP) stock and sell the July 24 Call option. This will give you downside protection of 13.3%. The current options market is factoring in a 75.9% chance American Express will be above the indicated strike at July options expiration yielding a 3% return. Option Strategy #2: Buy Bank of America (BAC) stock and sell the July 13 Call option. This will give you downside protection of 10.7%. The current options market is factoring in a 64.7% chance Bank of America will be above the indicated strike at July options expiration yielding a 5.5% return. Option Strategy #3: Buy BB&T (BBT) stock and sell the July 21 Call option. This will give you downside protection of 11.9%. The current options market is factoring in a 72.4% chance BB&T will be above the indicated strike at July options expiration yielding a 2.6% return. Option Strategy #4: Buy Bank of NY Mellon (BK) stock and sell the July 27 Call option. This will give you downside protection of 10.4%. The current options market is factoring in a 65.9% chance Bank of New York Mellon will be above the indicated strike at July options expiration yielding a 3.5% return. Option Strategy #5: Buy Capital One (COF) stock and sell the July 23 Call option. This will give you downside protection of 10.9%. The current options market is factoring in a 61.6% chance Capital One will be above the indicated strike at July options expiration yielding a 6.9% return. Option Strategy #6: Buy Fifth Third (FITB) stock and sell the July 7 Call option. This will give you downside protection of 15.8%. The current options market is factoring in a 77.1% chance Fifth Third will be above the indicated strike at July options expiration yielding a 3% return. Option Strategy #7: Buy Goldman Sachs (GS) stock and sell the July 135 Call option. This will give you downside protection of 10%. The current options market is factoring in a 71% chance Goldman Sachs will be above the indicated strike at July options expiration yielding a 2.5% return. Option Strategy #8: Buy HSBC (HBC) stock and sell the July 41 Call option. This will give you downside protection of 11.2%. The current options market is factoring in a 75% chance HSBC will be above the indicated strike at July options expiration yielding a 1.7% return. Option Strategy #9: Buy JPM Morgan (JPM) stock and sell the July 33 Call option. This will give you downside protection of 10%. The current options market is factoring in a 67.9% chance JP Morgan will be above the indicated strike at July options expiration yielding a 3.9% return. Option Strategy #10: Buy Morgan Stanley (MS) stock and sell the July 28 Call option. This will give you downside protection of 10.1%. The current options market is factoring in a 75.9% chance Morgan Stanley will be above the indicated strike at July options expiration yielding a 4.4% return. Option Strategy #11: Buy PNC Financial (PNC) stock and sell the July 39 Call option. This will give you downside protection of 11.1%. The current options market is factoring in a 65.4% chance PNC Financial will be above the indicated strike at July options expiration yielding a 5.5% return. Option Strategy #12: Buy Wells Fargo (WFC) stock and sell the July 24 Call option. This will give you downside protection of 10.3%. The current options market is factoring in a 64% chance Wells Fargo will be above the indicated strike at July options expiration yielding a 4.5% return. Option Strategy #13: Buy the Financial Select Sector SPDR (XLF) ETF and sell the July 11 Call option. This will give you downside protection of 13.1%. The current options market is factoring in an 81% chance the XLF will be above the indicated strike at July options expiration yielding a 1.2% return. To get a better return look at the September 12 Call on the XLF if you’re comfortable locking up shares for that long. Option Strategy #14: Buy the Proshares Ultra Financials (2X leveraged ETF) (UYG) ETF and sell the July 4 Call option. This will give you downside protection of 11%. The current options market is factoring in a 66.4% chance the XLF will be above the indicated strike at July options expiration yielding a 4.4% return. Option Strategy #15: Buy the Direxion Daily Financial Bull (3X leveraged ETF) (FAS) ETF and sell the July 10 Call option. This will give you downside protection of 15.5%. The current options market is factoring in a 62.8% chance the FAS will be above the indicated strike at July options expiration yielding a 10.2% return. These options expire on July 18; therefore the last trading day is Friday July 17, 2009. As you can see the less volatile the underlying stock and greater chance (higher delta current risk neutral probability of expiring above indicated strike price), the less the return % by expiration is. In the case the option expires out of the money (dead) I just write it out for a similar strike for the following month. Out of these 15 strategies, the strategy which appeals most to me is the FAS July 10. This is because the return is more than double the average of these 15 listed in this article, and the current risk neutral probability of expiring above the indicated strike is average. However I am a more risky investor. I don't recommend these leveraged ETF's for investing, but they make great trading vehicles and have allowed me to "bank" massive gains on the financial sector during this recent bullish trend. However I may decide to write some of my FAS out for the July 9 and July 11 as well. In this blog post I'll list some of the names I purchased on June 12, 2009. I have researched these stocks and found they all have similar bullish trends. After each stock I will give my Bull to Bear ratio (X:Y) and the Investor's Business Daily rating (IBD). For the criteria in each of these ways of rating a stock visit the "Hottest Blog Posts" section. I have been watching these stocks for the past 2 weeks, and I decided Friday would be the day I enter all four, as they were all down over 3% at one point. Stock Strategy #1: Level 3 Communications (LVLT) (10:2) (IBD rated 56) Today I purchased some common stock for $1.49 and was immediately able to write it out for the July $2.50 strike. Yes I have to hold the stock until July 18, 2009 but I was able to get 6.7% back on my investment with a chance of making a 74.5% return if the option happened to expire in the money. For more on covered call strategies check out my first E-Book. Stock Strategy #2: Rubicon Minerals Corp (RBY) (14:0) (IBD rated 90) Today I purchased some common shares on this small cap company which is based in China for $2.95 per share. Down over 5% I could not resist. The negative with this stock is it has extremely light volume, and no options on it. I believe if Gold and other precious metals get even hotter, this is a great stock to keep an eye on. Stock Strategy #3: Walter Energy Corp (WLT) (13:0) (IBD rated 99) Today I speculated on this company by opening up an option call spread position for the July 40/45. I was able to get into each contract for $90 and as I expect commodities to keep rallying, Walter should rally as well. With over a month until options expiration I believe I'll be able to net a gain from this strategy. I was able to get into this spread while Walter was down roughly 5%. Stock Strategy #4: Aluminum Corp of China (ACH) (13:0) (IBD rated 75) Today I speculated by purchasing call contracts for the July 30 on this stock for $125 per contract. As from strategy #2 I expect metals to continue to rally and this stock should directly benefit from that. Follow my blog for a weekly list of stocks I am buying/selling or looking at.